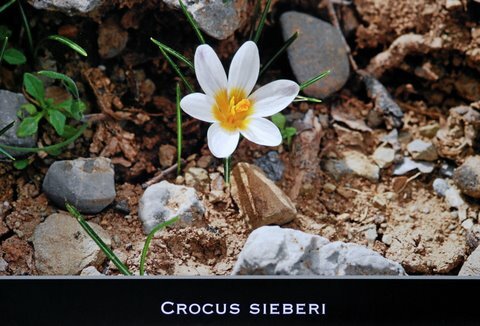 The 2011 Flowers of Crete calendar is now available at a cost of 10 euros plus post and packing where required. The title of this year's calendar is 'Favourite Flowers of Crete' and showcases some of the most beautiful species to be found on the island. 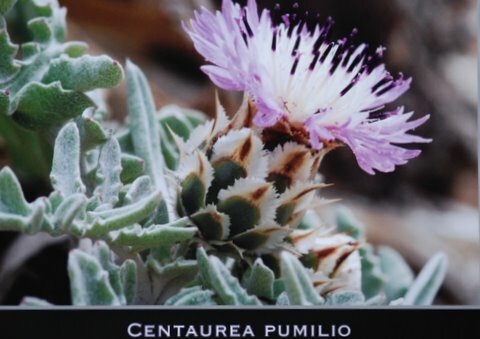 Its cover features sea daffodil Pancratium maritimum and is on the Flowers of Crete home page; there are two more pages illustrated below. This is our third year of production and the calendar is now a feature of many people's Christmas gift list. Please contact julia@flowersofcrete.info or rosemary.john@hotmail.co.uk to order your copies. Calendars can also be ordered in the UK at a cost of 8.75 GBP (plus post and packing) by e-mailing mtthwjones4@aol.com. Payment can be made by UK cheque or bank transfer. A lovely gift to slip inside a greetings card. Christmas designs are available. Also personalised bookmarks with recipient's name. 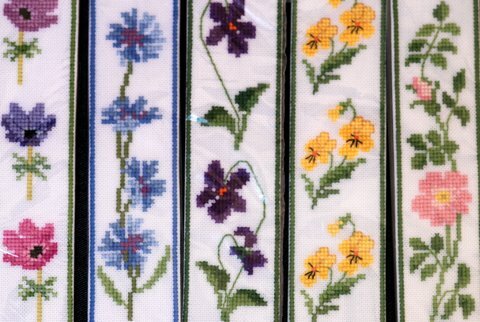 Flowers bookmarks - 7.50 euros (6 GBP) including post and packing. Name bookmarks - 10 euros (11.50 GBP) including post and packing. Payment can be made via PayPal, Sterling cheque or bank transfer in UK or Greece. 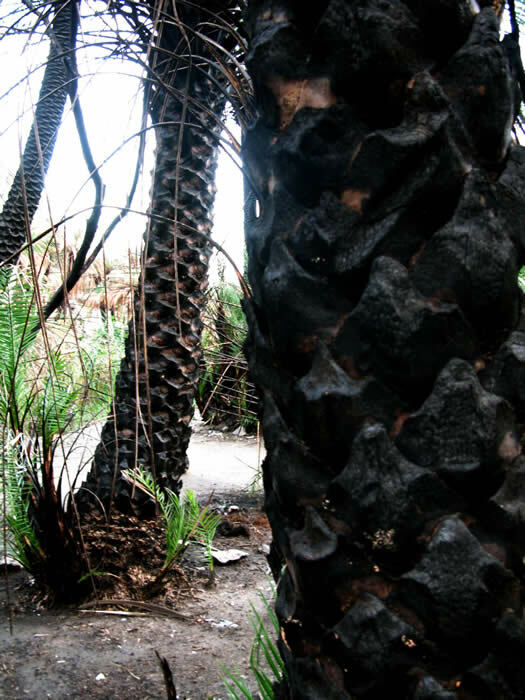 Cretan palms at Préveli recovering after fire: thanks to photographer Welmoed Schmidt, who visited Préveli recently with artist Jane Vogas, we can share these reassuring images of the re-growth of the damaged endemic palms, Phoenix theophrasti. Jane and Welmoed visited Préveli a few weeks ago and it is obvious that regeneration is taking place. Photos taken on 11 November 2010. We are absolutely delighted that John has agree to talk to members and supporters of Flowers of Crete at BioAroma in Aghios Nikolaos at 8 p.m. on Monday, 25th October, 2010. The talk and slide show will be entitled ‘Plants for a Mediterranean Climate’. We expect this event to be very well attended, so if you would like to be there, please let me know — julia@flowersofcrete.info — so that we can get some idea of numbers. along, please let us know as soon as possible. There will be a raffle in aid of Flowers of Crete, for which the prize will be a signed copy of ‘Flowers of Crete’. If you would like tickets please contact Rosemary or Julia. In response to requests for information about the proposed golf resort by Minoan/Loyalward in conjunction with the Abbot of Toplou at Cavo Sidero (in the far east of the island), here is the latest information from Dr Jennifer Moody. "Time continues to tick away and there is still no published decision on the Cavo Sidero court case. Things, however, are not entirely static. The parliamentary investigation begun by G. Sanidas in 2008 (more here) continues under deep cover. In January 2010 a freeze on the development by the new Ministry of the Environment was announced (more here). In June 2010 Euronews published a non-committal piece on the conflict (here). The petition continues add signatures and has nearly reached 11,000." Dr Jenny Moody is a research fellow of the University of Texas in Austin and co-author of the book 'The Making of the Cretan Landscape'. She also fronts the opposition to the Cavo Sidero development, which also contains examples of rare pre-historic archaeological remains. She is also an expert on the environmental history of Crete. Further information on a documentary regarding the Cavo Sidero development from Cliff Cook. The documentary, “A Thousand Lost Golf balls”, has been completed after two years’ preparation and, has had its first showing here in Chania, to great success. The film is about the proposed development by an English company, Loyalward/Minoan, of the Cape Sidero peninsula in eastern Crete, a development which the company itself boasts as being the largest in the Mediterranean and a “yardstick for Greek tourism” but which its opponents disclaim as a mammoth scheme which threatens the Cretan landscape. The film has a variety of objectives: first of all as a record of this unique area as it is now, so that viewers will understand exactly what is in danger of being lost. Secondly, it aims to explain what the English company are proposing and to examine these proposals critically from different points of view. At the centre of the documentary is a discussion of the major issues of the development including its financial and legal basis, the availability and sources of water, land use and the environmental and social repercussions, drawing on interviews with experts in these areas both from Cretan, Greek and foreign universities. In particular the subject of golf development is explored, not just as it might affect the Cape Sidero area, but as it has already affected other areas in Spain, Portugal and Italy, leading to a consideration of the wider implications of globalization. Finally, interviewees look to the future, making a series of alternative proposals for forms of development that would provide local people with a source of income while not putting their area at risk. In addition to these arguments the film tells the story of how and why director Vangelis Kalaitsis and scriptwriter Cliff Cook became involved with the subject and the area and set out to make the film and of how their awareness of the issues widened with each new visit and each new contact; a journey of discovery. 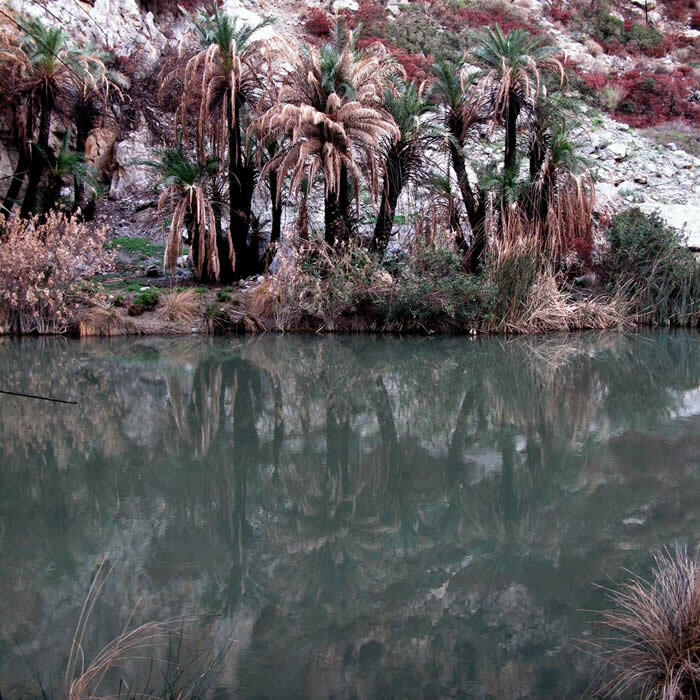 A fierce fire has badly damaged the native Cretan palm Phoenix theophrasti population at Preveli on the south coast of Crete. The fire, which was apparently started – presumably deliberately – at three different sites in the grove, took hold last weekend (21/22 August 2010). With accompanying high winds, it was impossible for fire fighters to prevent extensive damage. 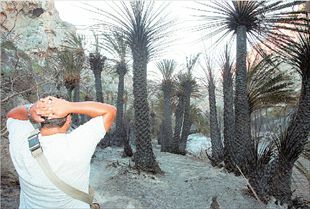 Reports suggest that 70 per cent of the palms were burnt. An emergency meeting was called in Rethymnon last week, but, so far, we have received no feedback from this. What are the prospects for the palms to re-generate? Will this affect their resistance to damage from the red palm weevil (more on the weevil here)? “I have been advised that P. theophrasti is likely to be resistant to fire damage and should recover quite well, with only the very old and very young palms suffering major damage. “As far as the weevil is concerned, experience in Italy has shown that P. dactylifera is more resistant than P. canariensis. It is likely then, that P. theophrasti will be more resistant, but this has yet to be proved. If this should prove to be the case, it may eradicate the hybridization problem." In an email to Flowers of Crete, Mr Spanner also commented on the biggest grove of Cretan palm at Vai. “Another threat to Vai is demonstrated by the fact that most palms in the grove have been observed with smallish heads with yellowish leaves, especially towards the centre of the grove. This may possibly be as a result of too much water being taken from the water table to supply local agriculture and tourist needs. This would cause salt water to leak into the grove from the beach. The Committee of Flowers of Crete is pleased to announce (on 31st August 2010) that, after many delays, the Zylogos papers – for a not-for-profit organisation – have been submitted to the Greek court. The hearing regarding charitable status will be held on 1st December, 2010. If you would like to add your voice to our work, please get in touch. Sponsorship is now coming in and we would like to thank those who have donated. Contributions are always needed for this vital work. If you would like to help in any way please let us know. The Flowers of Crete web site is part way through an overhaul, with the help of Honeyguide Wildlife Holidays. Honeyguide's Chris Durdin is helping with the web update, and Honeyguide has sponsored the web hosting cost for the next year. By coincidence, this is in the first year since 1996 with no Honeyguide group on Crete: the fully-booked holiday in April, as always based at Plakias, was called off at the time when so many flights were cancelled due to volcano ash. They'll be back next year, says Chris. News archive: for more old news, click News 2008 or News 2009.